It’s the Solemnity of Saints Peter and Paul! Today is one of our most favorite feast days of the entire liturgical year. What hope it gives us to meditate on these two men – one a betrayer, the other a murderer – who became such loyal friends of Our Lord that we call them the two Pillars of the Church. They witnessed to Christ, even to the shedding of their blood. How differently one looks at martyrdom in today cultural climate. It’s no longer a romantic idea from the distant past. We see it on the news weekly, if not daily, as Christians in the Middle East are brutally slaughtered for confessing Christ. And as the hostility toward Christianity escalates in our own nation, we should consider that white martyrdom may not be the only kind of martyrdom to which we are called. 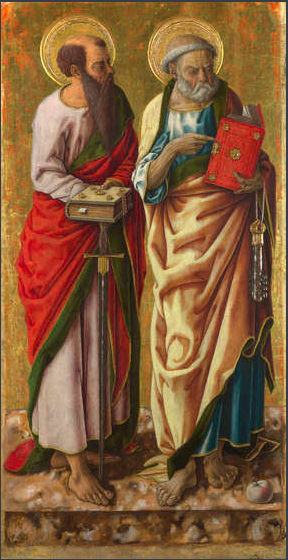 May we be strengthened by the example and intercession of Saints Peter and Paul, who loved Jesus unto death. We found the above prayer here, and there are more beautiful prayers and information to be found there about today’s feast. This entry was posted in Saints & Angels, The Church and tagged martyrdom, prayer, Saints Peter and Paul by texasnuns. Bookmark the permalink.